Right click on the project to which you which to import files. Note that the project need not be set as a Main project to import packages into it. Right Click on the Project Name ! In the window that opens, Choose Libraries in the left panel as shown below. 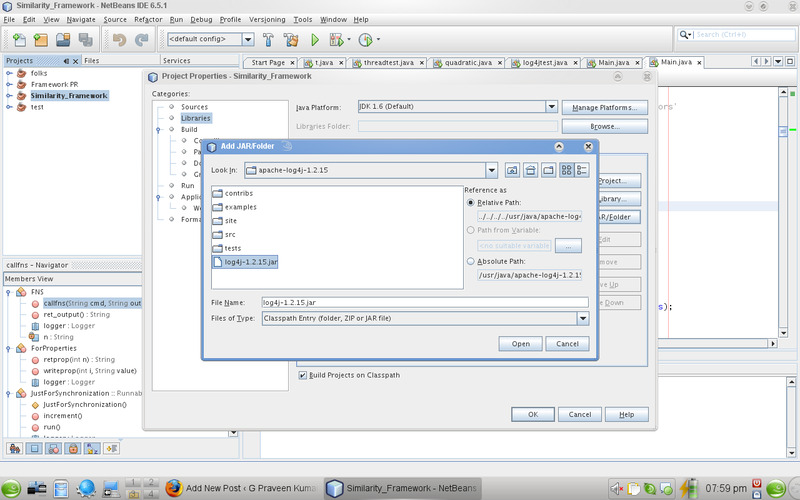 On the right hand side of the window, I hope, you can see an option called ‘Add JAR/Folder‘, click on that. Select Libraries from the Left Panel ! As shown below, in a tab called ‘Compile‘, you can see the files that you have added (This is the default chosen tab, so after you have pressed ‘Open‘ in the previous step you will land here). Repeat the process if you want to add more files and then press ‘OK‘. Another windows opens and you can see that the things you have added get saved (This is what the window shows :), it is just to see, nothing needs to be done). Previous Entry: A Short Touching Story ! Which one… be specific !! If you meant importing projects, YES !! THANKS alot for the help. And thanks for putting link to this page in the java forum. Yes, thank you very much. 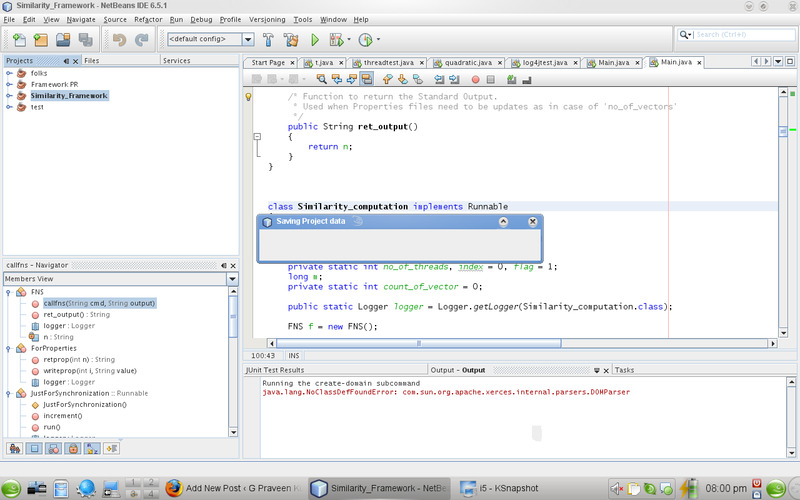 It all looks simple now – I should have recorded all the other places in netbeans where I tried to add the .jar. Thanks again. how can i make the jar file run and include the theme jar file ? I don’t think there was any problem with including the jar. The problem could be something else, I feel ! Hi! Situation: a I have a my library (myLib) that use 3rd part libraries. I want use myLib in other project (bigPrj). Problem: on bigPrj, NetBeans does not copy the 3rd part libraries. Is there an automatic way for resolve the problem? Great work dear friend…!!! Thankx…!! I could n’t get the output. I got an error that says class not found.That class is included in the jar file i added..
i added a jar file, but when i try to import any of its classes it gives error. Thank you! After following the instructions detailed here, I was able to compile the program I’m having problems with. I initially tried to add the JAR file by clicking TOOLS, then selecting libraries. 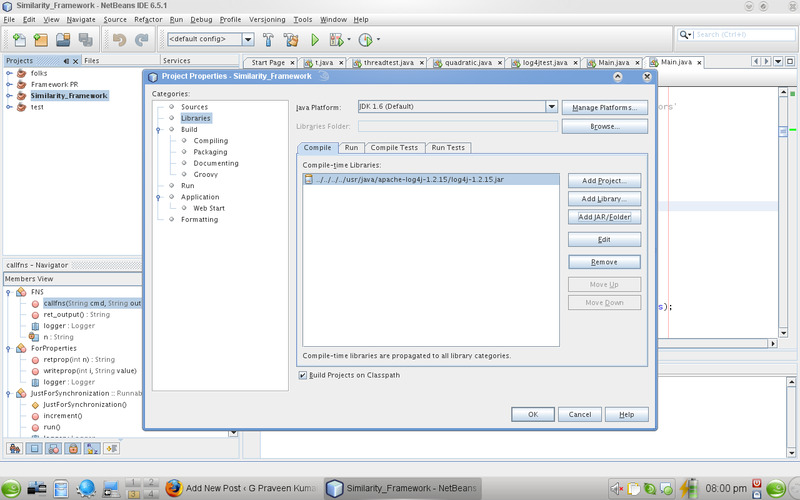 When I compile, it still cannot find the package which is in the JAR file I added. Thanks again I was able to find your post about this in one of the forums. How to add jar file using java file coding? Muchas gracias andaba con un error y esto me recordo que faltaba agregar la libreria del conector, hasta pronto!!! hi ..i tried the procedure above to use a java3D class( it was very helpful) and add it to the library of the project i wanted to use on. It did remove all the compilation errors, but when i try to run the project, i get another exception like this.. The project does compile, but crashes when starting, showing the same messages you’ve posted. Information about how to properly configure Java3D libraries is quite welcome!! Thank you. Nice tip, this is not an intuitive process for newbies..
i followed all your steps, i am able to include the jar files, but when i use it in the code, it says package not found. Awesome Praveen!! Its your love!!!!! I love you!!!! now i have a problem…. when u “clean and build” we get the jar file . and i converted it to exe . now the problem comes .it cannot find the external jar file which i have imported. This is a kind of old Post. But I have a specific problem with my NetBeans. I don’t see Libraries when I right click on the project and Properties. What do I do?? This feature might not be there in newer versions of Netbeans. Could you please help me in providing a solution or workaround?? It may be really simple but I’ve spent many hours and I just can’t figure this out…I’d really appreciate any help! Thank you in advance :)! !